My Tombstone Tuesday post doesn’t feature any of my ancestors, nor does it focus on any one headstone in particular. 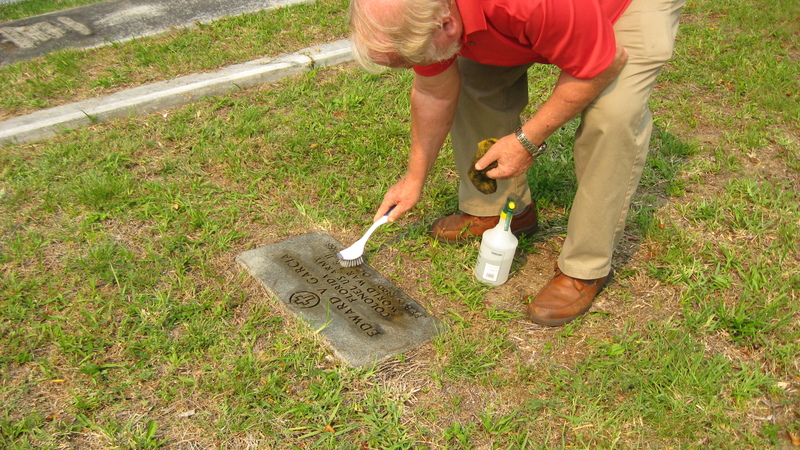 Instead I thought I’d show you what the Amelia Island Genealogical Society is doing at Bosque Bello Cemetery, which is on Amelia Island, Florida. We spent a couple of hours at the cemetery this afternoon, perfecting our techniques and working out any kinks in the plan to photograph and identify every plot. 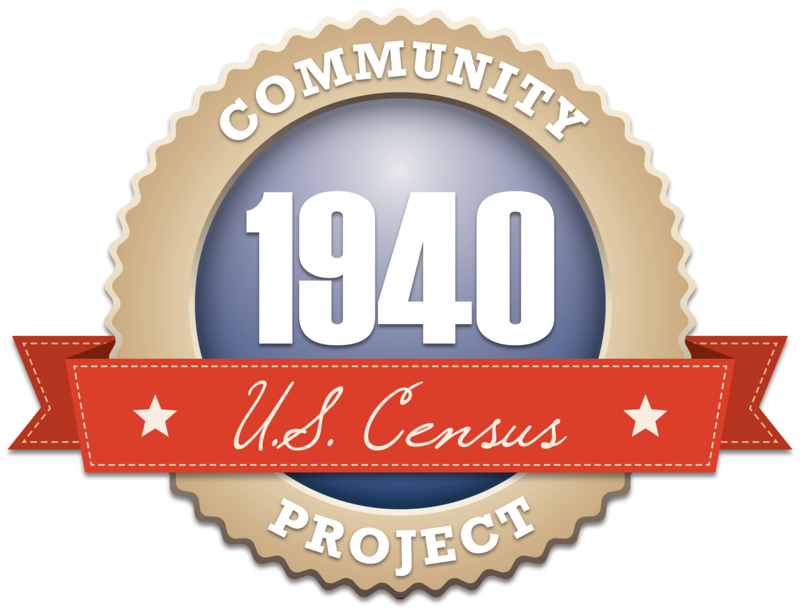 Ultimately, our goal is to photograph about 70 divisions (each one containing multiple sections) and tie the information to a database that will be posted on the society’s web site, to go along with other basic data that has already been collected. When the team begins a new section, the photographer in the group first takes a shot of the whiteboard, which lists the section number and division number. The next photo is a wide shot of the cemetery section (usually 10 plots), taken from one corner after the section has been marked with flags or tape. 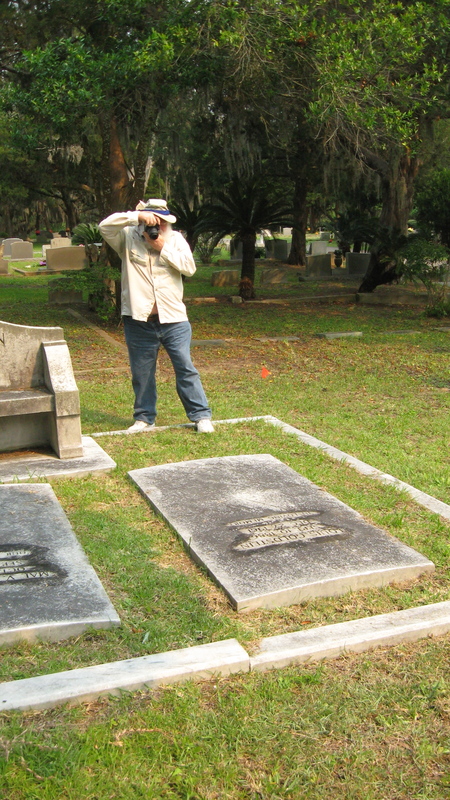 This we call our zero photo, and it shows the relationship of the headstones within a section to its boundaries. 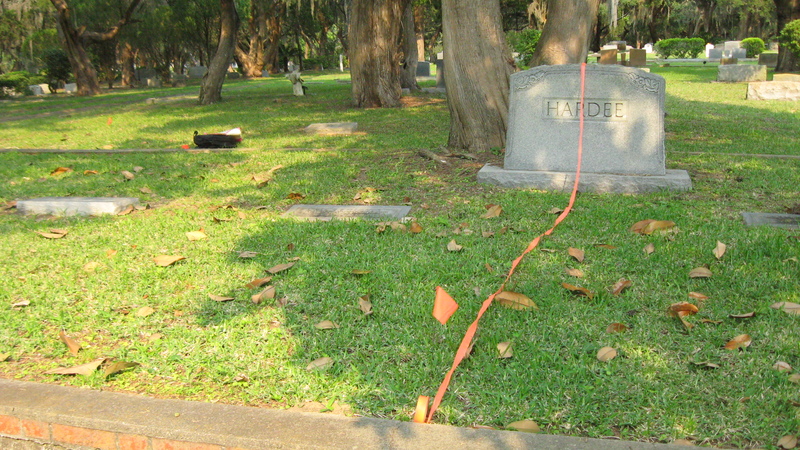 Starting with plot number 1, each plot is photographed with the whiteboard propped up against the headstone or footstone. 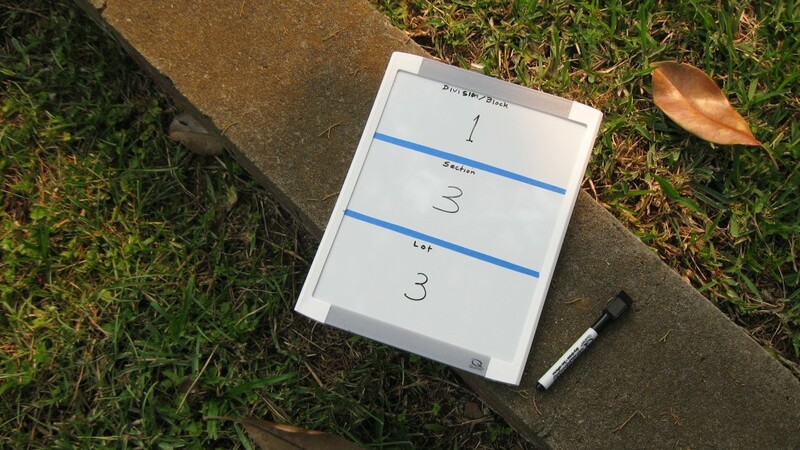 The plot number is written on the whiteboard, and changed for each subsequent photo to match the plot number. Then another photo of the plot is taken without the whiteboard. The team works its way plot by plot from 1 to 10 until the section is completed. 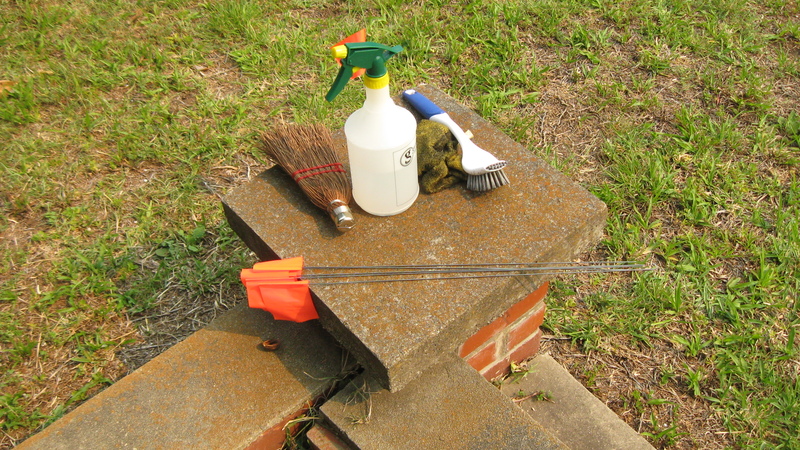 If the stone needs cleaning, distilled water, a brush, and a microfiber cloth usually do the trick. Sometimes a quick brushing with a whisk broom is all that’s needed before taking a photo. Extra items, such as medallions, are photographed separately if necessary to show detail. All the photos were shot in JPEG and Raw, and will ultimately be batch processed for naming, and reformatted to the optimal size for inclusion into our database. 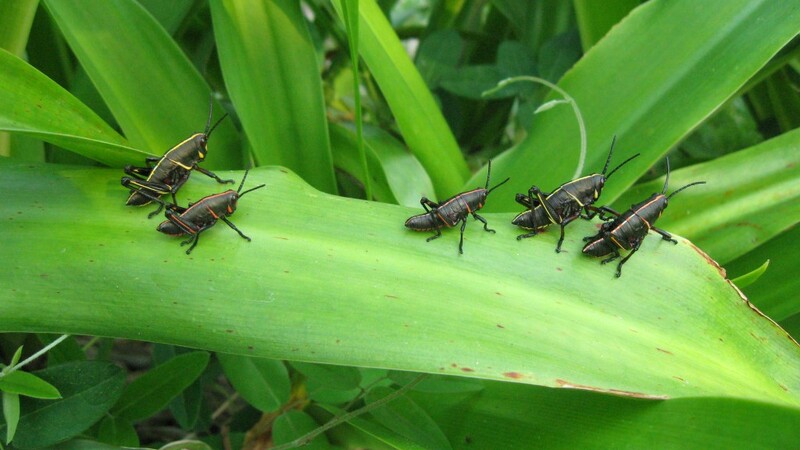 Like the dog who suddenly thinks “squirrel!” in the middle of a thought, I was distracted by these colorful grasshoppers when I was on my way to mark a section. I had to stop and take a picture. This was my first time ever doing a cemetery photographic survey. It takes patience, as many arms as an octopus, some navigational acumen, lots of drinking water, bug repellant, and good company. For me, especially, I thank my husband, who took direction very well, and did only what he was told to do (take photos). Here’s a tip: I think the photographer had the easiest job of all. Hey, did I hear someone mention “she who must be obeyed”?